PHILIP BLACKER – ‘Farewell, Leicester Square’ – An exhibition of bronze friezes – a perspective from one hundred years on. Thompson’s Gallery London has the honour of presenting, on the centenary of the beginning of WWI, this sensitive and astonishing tribute of bronze friezes by renowned sculptor Philip Blacker. Philip Blacker, born in 1949 and educated in Dorset, became a jockey on leaving school and rode professionally for 13 years. After being placed in the Grand National on several occasions and riding 340 winners, he retired in 1982 to concentrate full time on sculpture. Since then, Blacker has carried out countless commissions and had many successful London exhibitions. This exhibition of bronze friezes related to the subject of World War One will be held at Thompson’s Gallery, 15 New Cavendish Street, London, W1G 9UB. In 2013 Blacker’s long-time friend, Brough Scott, the horse racing journalist and grandson of General Jack Seely, commissioned Blacker to produce a sculpture that would immortalise his grandfather’s famous horse ‘Warrior’. While researching ‘Warrior’ Blacker was inspired to create these WW1 friezes. 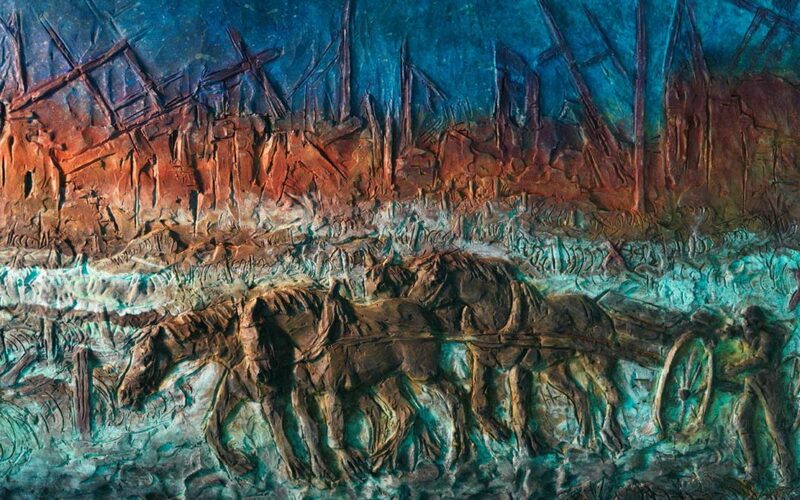 With the great wealth of literature and music that documented the war itself, Blacker has taken lines from recognised WW1 poetry and music and adapted them into bronze wall-mounted friezes, depicting heroic scenes from the battlefields and beyond. To do this he has created a compelling new concept in bronze sculpture. His interpretation involves friezes which are essentially scenes from life in 1914 and then cast in fragments of metal, as if from a larger picture. Colour is integral to the composition to give the pieces intensity and depth and this is achieved by the traditional method of heating the bronze and applying chemicals and dyes. However the colours he achieves are anything but traditional and contain a subtle unpredictability that do not just enhance the sculpture, as most patinas do, but are fundamental to the work. This fusion of colour and the three dimensional compliment the subject they depict. The colouring process involves a spectacular visual process, after the work has been cast. “The inspiration for my WW1 friezes come from a variety of sources. A couple are inspired by paintings, notably by CRW Nevinson and Paul Nash, but mostly they come from poems, letters, songs and books. These words allowed my imagination to perceive them through the medium of my bas relief panels. They may well not be an accurate depiction but that is not really the point. They are just my interpretation, inspired by the words of those who were there. I have not focused on the tragedy of the war itself, that having been well chronicled, but more of life behind the lines. Where the front line has been depicted it is usually in a moment of reflection. The bronze friezes have been coloured with the application of chemicals and dyes applied to the hot bronze, which I believe gives them a unique and random quality. Unlike painted bronze sculpture which, in my opinion, is essentially two art forms in conflict and competition with each other, these patinated bronze friezes are a union, bringing colour and depth to the work while complimenting the underlying form.Only three will be cast from each mould, but every one of them is essentially a one off as the patination on all of them are deliberately different”. Philip has developed an unusual concept in bronze sculpture. His interest in sculpture friezes developed when he desired to extend his work beyond just three-dimensional sculpture. He wanted to incorporate scale and perspective into the work whilst still retaining a three dimensional element, placing the work into its natural landscape. What has been particularly exciting and innovative is the addition of colour with the use of patinas applied to the hot bronze, which produce different chemical reactions. Unlike paint, which completely obliterates the surface below, these chemicals and dyes will only work on a bronze surface. It is the bronze that is integral to the whole thing, and one can only achieve these effects on that metal. This gives the work a haphazard, almost chaotic, effect, which is particularly suitable to the subject of WW1. As a sculptor Philip never expected the exciting and vibrant effects that could be achieved when he started experimenting with these patinas. Various factors like the heat of the bronze, the strength of the patina and how it is applied give the work an incidental feel. Philip also wanted his WW1 panels to be like a segment from a larger scene, giving the viewer a glimpse of a picture condensed into a fragment of solid bronze. Consequently many of these pieces are cast in irregular shapes, fragments which hang on a wall space. Philip’s interest in WW1 started in 2011 when he created a half-life size bronze of a horse entitled ‘Flanders Mud’. This piece coincided with his experimental work with the bronze friezes. Having been commissioned to create a large sculpture of General Jack Seely and his famous warhorse Warrior, his research into that subject led to a further interest and a visit to the Somme battlefields. His military background lent an added interest. The horrors of WW1 have been well chronicled, but this new medium inevitably looks at the war from a different perspective, viewing it from a hundred years on. For this reason he has also avoided in the main being specific in location, preferring a more general view. Only someone who was there can chronicle locations precisely, but through this original medium and its interpretation of the war, Philip hopes that he can add his own dimension to the perception of WW1. Philip Blacker was formerly a professional steeplechase jockey for 13 years, riding 340 winners and being placed in the Grand National three times. Under the guidance of Margot Dent, a former pupil of John Skeaping, he devoted as much time as possible to sculpture during his racing career. In 1982 he retired to concentrate full time on sculpture holding his first one-man show at the Tryon Gallery in 1983. He has since created sculptures the world over including 26 life-size bronzes of famous racehorses which ‘stand’ all over the globe. Philip’s father, General Sir ‘Monkey’ Blacker fought in the second world war in France earning an MC. In a successful military career he served in Northern Ireland and became Vice Chief of General Staff. During this time he was also a successful amateur jockey and International show jumper with his famous horse Workboy. He was also a prolific writer and painter, writing his autobiography entitled ‘Monkey Business’. Philip’s brother Terence is a successful novelist and journalist. ‘Farewell Leicester Square’ An exhibition of bronze friezes by Philip Blacker – a perspective from one hundred years on will run from 6th November 2014 for two weeks at Thompson’s Gallery, 15 New Cavendish Street, London, W1G 9UB.